New Years day was strange. I’m still getting used to the weather in Tucson – I just couldn’t believe that it was 82 degrees Fahrenheit and completely sunny. What the heck? Seriously? Where’s the ice? Snow? Insane windchill off Lake Michigan? Though I can’t really say that I miss any of those things. I mean, maybe I miss some of the snow, but not as much as I thought I would. Kirk and I spent the morning of New Year’s day taking down all the Christmas decorations (it was just as exciting as it sounds…), and then went for a drive in the afternoon. We decided on a whim to head out of Tucson and go south to Sonoita, a small little ranch town that is sort-of between Tucson and the Mexican boarder (I say “sort-of” because it’s a little out of the way). I originally heard about Sonoita from an older gentleman I met on an my flight back to Chicago the first time I came to Tucson to interview for my now job. He sat next to me and was full of amazing stories – he was the kind of person that you meet randomly, and desperately wish you could get to know better. We ended up talking through the entire flight, and he mentioned that he had a ranch in Sonoita in addition to owning the local feedshop. His wife also own a local Native American Jewelry store called “Many Horses Trading Company”. When we parted ways when our flight landed in Chicago, he told me that we’d meet again (I believe he said “jusqu’à la prochaine fois”, meaning “until next time” in French). I genuinely hope we do meet again. He said that he thought we would. Anyway, because of my conversation with this kind stranger, I had grown deeply curious about Sonoita and finally decided to go down and see what it was like. We rolled down the windows on the car, put M83 and Youth Lagoon in the CD player, and took in the scenery as we headed out of town and drove through part of the Coronado National Forest. Feeling the wind blowing through my hair and the sun on my skin was amazing. I just couldn’t believe it was January 1st. In short, Hwy 83-S is an amazing drive from Tucson, and Sonoita is a great town. It looked like there were a couple of vineyards scattered around as well, which could become part of the trip plan the next time we go down there. Of course, given it was New Year’s day all the stores were closed when we got there. But if you ever have a chance to make the drive from Tucson to Sonoita along 83, you should. It’s a great drive for a day when you can roll the windows down and play your favorite music. So far, I love living in the southwest. But, all of this is not the point of this blog entry. Rather, I wanted to take some time to tell you about the meal that we made for dinner tonight. Because we’ve been having such nice (still unbelievable) weather, we decided to grill some steaks. My parents gave us a Weber charcoal grill for Christmas, and the Whitmores (family friends who are, for all intents and purposes, family) sent us some Omaha steaks. Put two and two together – it was time to break in the grill. Luckily, along with our grill, my mom had also bought us Bobby Flay’s Boy Meets Grill. Oh my goodness – how did I not know about this book earlier? I mean jeez, it came out almost 13 years ago (yep, it’s been 13 years since since 1999. There’s another reality check). I guess I had always discounted “Bar-B-Q” related cookbooks since I was trapped living in apartment in the city (without a deck or porch). Well, hello world of grilling! Everything in Bobby’s book looks delicious. I want to make all of it. My stomach starts rumbling every time I flip through it. I should have discovered grilling earlier. Well, we could only select one recipe to start with, and we decided to try (with a few modifications – namely replacing the fresh cilantro with dried parsley) the “Beef Tenderloin Crusted with Cumin and Fresh Garlic”. To accompany the steaks, we cooked up two of the baked potatoes that also came with our Omaha Steaks. Hmm. The meal still needed something (something green and vegetable-y, I mean, it is a new years, healthy eating blah blah blah and all that business), so I raided the fridge and tossed together a salad that I’m now fairly certain is going to go into the permanent recipe collection – Broccoli Slaw Salad. I should tell you, I ❤ Broccoli slaw. It’s been a favorite in my kitchen for a while now. And this recipe has further solidified it for me. 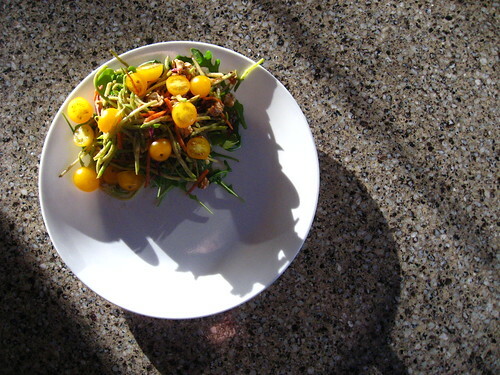 Neither of the two recipes that I’m sharing with you today are rocket science, but combined they make for a meal reminiscent of a late afternoon on a warm summer day. I know that most of you are trapped in cold weather right now, but let this remind you of the light at the end of the tunnel! Afternoons of sitting on the patio and watching the sun set are not far off. Place the oil, cumin, garlic, lime juice, parsley (or cilantro) and pepper in a food processor (note: we used our mortar and pestle for a most rustic marinade) and process to a smooth paste. Place the tenderloins in a small shallow dish and cover with marinade, rubbing it into the meat. 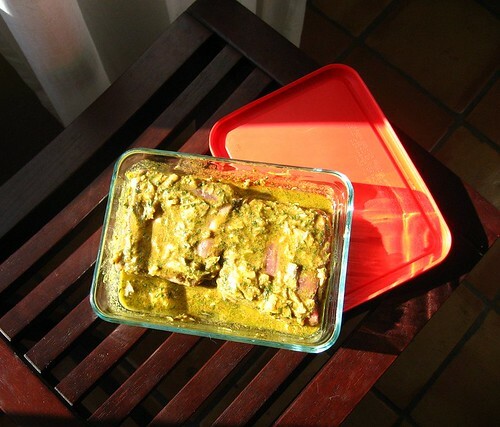 Refrigerate, covered, for at least four hours, or ideally overnight. 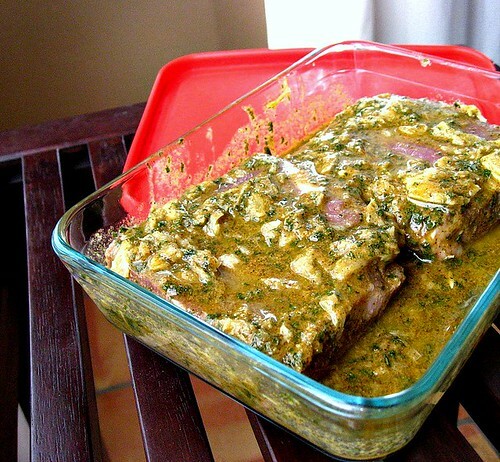 Remove the tenderloins from the dish, leaving as much of the marinade on as possible. Season with salt, and grill until you’ve achieved your preferred level of “done-ness”. We like our steaks medium. They were about an inch thick, so we cooked them for 5-6 minutes on the first side, and then 3-4 minutes on the second side. Our grill was closer to “High” heat though… we still haven’t quite mastered controlled cooking with charcoal. Remove from the steaks from the grill and serve! Evenly divide the arugala onto two plates. It will form the “bed” for your broccoli slaw salad. Toss the broccoli slaw, sunflower seeds, feta cheese, olive oil, and vinegar in a bowl together. Mix well to make sure that all ingredients are evenly coated with oil and vinegar. Spread the broccoli slaw mix on top of the arugula. 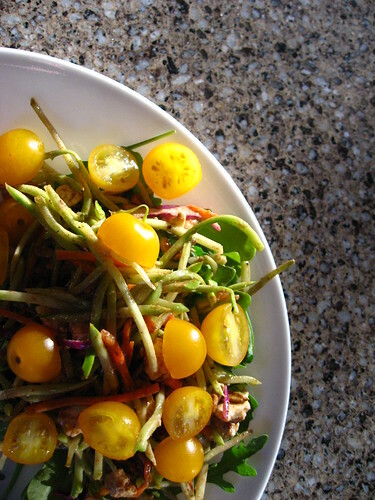 Gently drop the halved cherry tomatoes on top of the salad. Now, you may be wondering why there is no picture of the finished meal, aren’t you? Well, after a little snafu with getting the grill chimney lit properly, we were rushing around with the timing of the meal. When the steaks were finally done, we were so relieved to have everything plated that we sat down and immediately celebrated by eating all of the food. So be it. Food is meant to be eaten and not always photographed. That’s what happens when you’re swept away in the moment! Happy 2012 to all of you – may you smile everyday, and live your life like you mean it.